Breakfast at Beach + Bites restaurant or in the privacy of your room. Access to the pool, beach, bar and rooftop terrace where you can enjoy our breathtaking view. This calming marine-inspired room is decorated to enhance your state of BLISS. Large comfy cushions dress the Queen size bed. The en-suite bathroom with large shower and exquisite fixtures is beautifully designed to meet your every need. 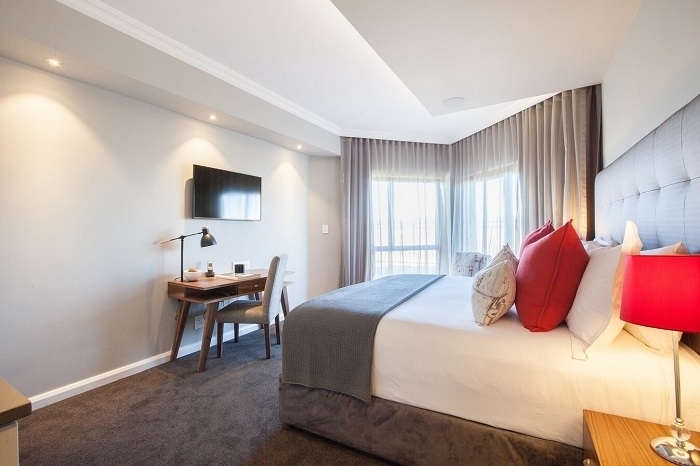 Step out onto the deck where you’ll find seating just outside your room and enjoy the view of Table Mountain from this ground floor room which is ideal for a couple, or a solo traveler. The 100% blackout curtains turn day into night until you decide to draw them open and enjoy the supreme view. All our rooms have been designed to anticipate your every need including an array of luxuries and services. Relax in style or work in your room while you enjoy our delicious room service menu. Don’t forget, your room card will allow you to exit the gate and gain access to the private beach. 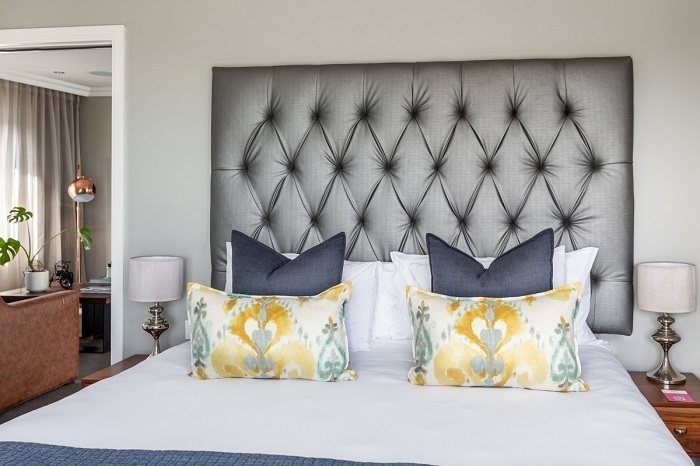 Sleep in a state of BLISS on our extra comfortable pillow top beds with silk duvet Inner, silk pillows and luxurious Egyptian Cotton linen, and to rest your head, a selection of pillows from our pillow menu. 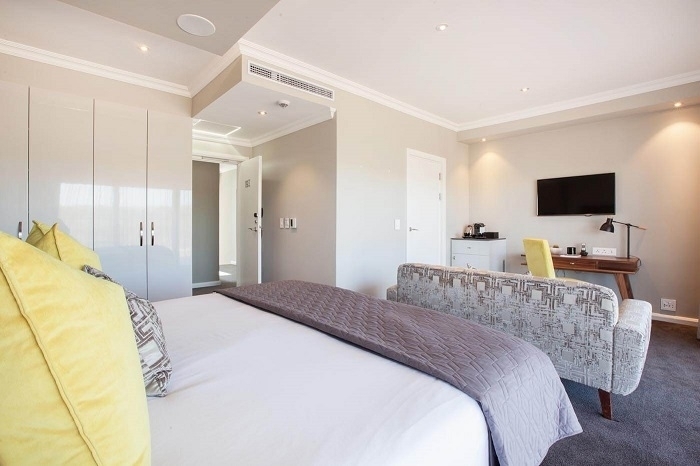 Our Oceanside Junior Suite offers a panoramic view of Table Mountain, Lions Head. Walk from your patio down to the ocean. Sit back and relax in our stylish rooms with cozy ambience and calming mood lighting. At night enjoy our turndown service with your fleece robe and slippers laid out, ready for you to slip into. Modern bathroom with luxurious shower and slipper tub including a full set of Bliss toiletries to pamper. Complimentary Wi-Fi access in the room and around the hotel. View the gorgeous Atlantic Ocean as far as the eye can see, and just across the bay, the buzzing center of Cape Town! 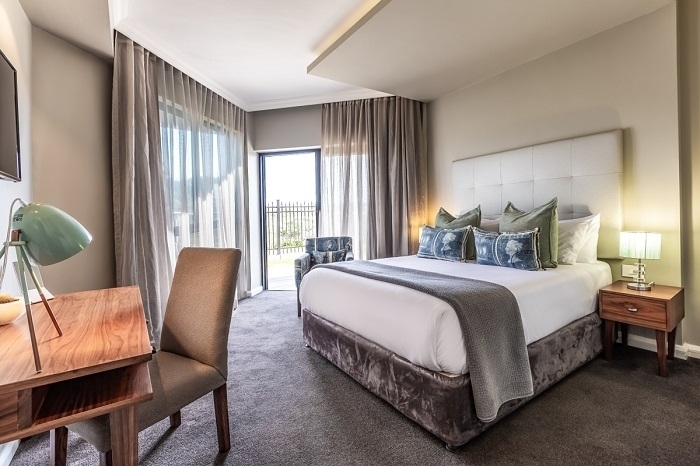 This stunning room is located on our second floor providing spectacular views of Table Mountain, Lions Head and Robben Island. 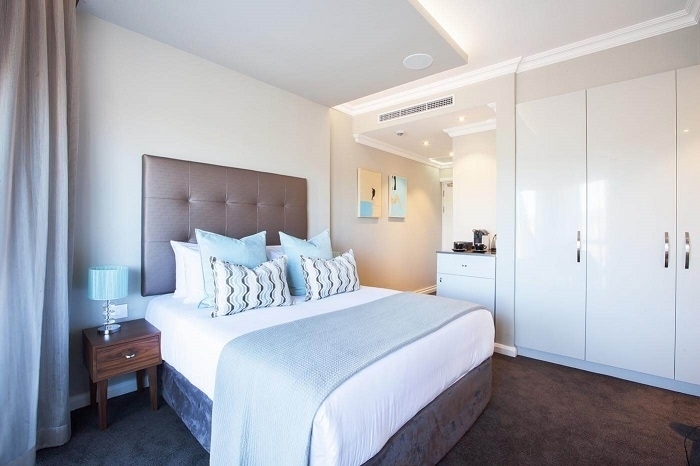 Walk downstairs to your own slice of heaven on our quiet beach, or sit back and relax in our stylish rooms with cozy ambience and calming mood lighting. As evening sets in, enjoy our turndown service with your fleece robe and slippers laid out invitingly for you while you watch the twinkling city and nightlife beckoning you from just 15 minutes away. Modern bathroom with luxurious shower and a full set of Bliss toiletries. 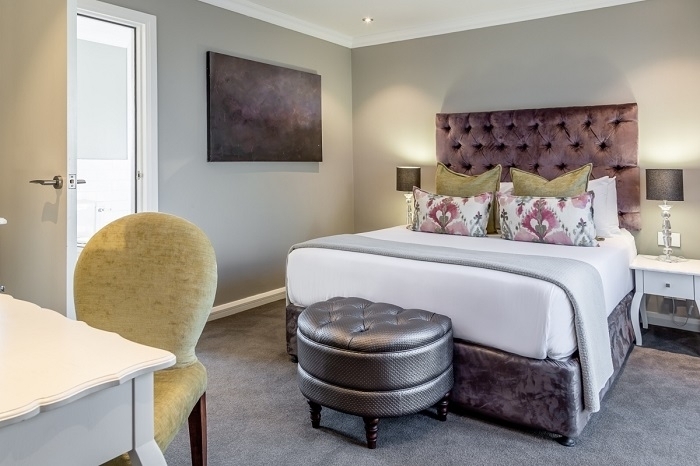 Enjoy a great night’s sleep on a Queen bed with large comfy cushions and top quality linen. 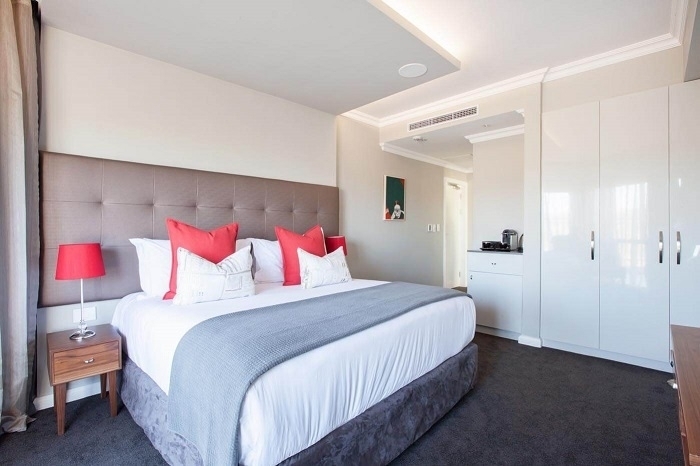 This modern and vibrant room has an en-suite bathroom with a shower and exquisite fixtures. Enjoy the view of Table Mountain and the Atlantic Ocean from your balcony or go downstairs to the beach via your own private pathway! Being situated upstairs means you have easy access to the restaurant and our popular rooftop viewing deck. Be sure to order a BLISS Martini to enjoy the sunset in style. All our rooms have been designed to anticipate your every need including an array of luxuries and services. Relax in style or work in your room while you enjoy our delicious room service menu. Don’t forget, your room card will allow you to exit the gate and gain access to the private beach. Sleep in a state of BLISS on our extra comfortable pillow top beds with silk duvet Inner, silk pillows and luxurious Egyptian Cotton linen, and to rest your head, a selection of pillows from our pillow menu. Book this room on its own or with room 202 as a two room suite for families. This sunny upstairs room decorated in pale lime tones boasts a King size luxury pillow top mattress for the ultimate sleep experience! Walk out on to your private balcony outside and feel the ocean breeze on your face, or melt away the stress of the day by enjoying a powerful shower, just what you need to unwind. The view from Room 202 is so spectacular; we wouldn’t blame you for wanting to stay an extra night! All our rooms have been designed to anticipate your every need including an array of luxuries and services. Relax in style or work in your room while you enjoy our delicious room service menu. Don’t forget, your room card will allow you to exit the gate and gain access to the private beach. Sleep in a state of BLISS on our extra comfortable pillow top beds with silk duvet Inner, silk pillows and luxurious Egyptian Cotton linen, and to rest your head, a selection of pillows from our pillow menu. Try this room on its own or with room 201 as a two-room suite for larger groups. This Victorian Inspired room has a modern twist. Relax in a room where the old-world style of yesteryear meets the luxuries of today. This magnificent room is meticulously finished with classic Victorian fixtures, the en-suite bathrooms are absolutely stunning, with a large bathroom inclusive of a Victorian bath and massive shower. Breakfast at Beach + Bites restaurant or in the privacy of your room! Access to the pool, beach, bar and rooftop terrace where you can enjoy our breathtaking views. Modern bathroom with luxurious bath and shower, with a full set of Bliss toiletries! This beautiful Victorian themed signature room is ideal for a couple. The cozy Queen size pillow top bed is scattered with comfy cushions, ideal for a leisurely snooze. The en-suite bathroom boasts a beautiful Victorian era slipper-bath and large shower. Open the pocket doors to the Juliet balcony to enjoy the sound of the ocean while you sip on a glass of wine. This Victorian room has a modern twist. Why not relax in a room where the old world style of yesteryear meets the luxuries of today? 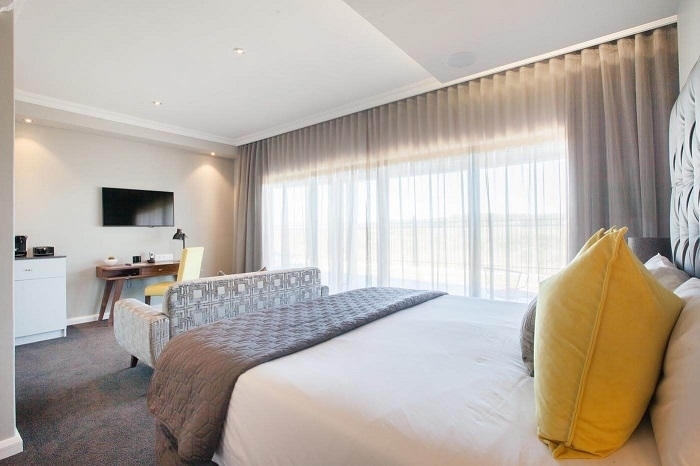 This plush room is a business travellers dream – a bright room with a large desk, ideal for those needing a quiet haven to rest between meetings or use the evening to catch up on emails from the comfort of their room. If you’re travelling on business this is a great room for you. 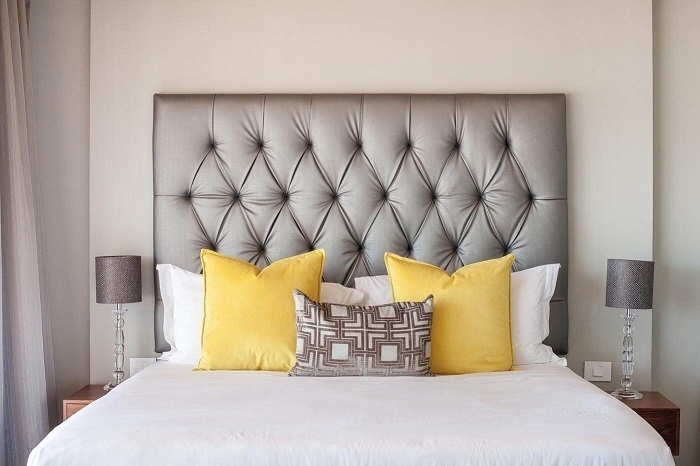 Sit at the desk and work in peace or simply drift off to sleep on the Queen size pillow top bed. 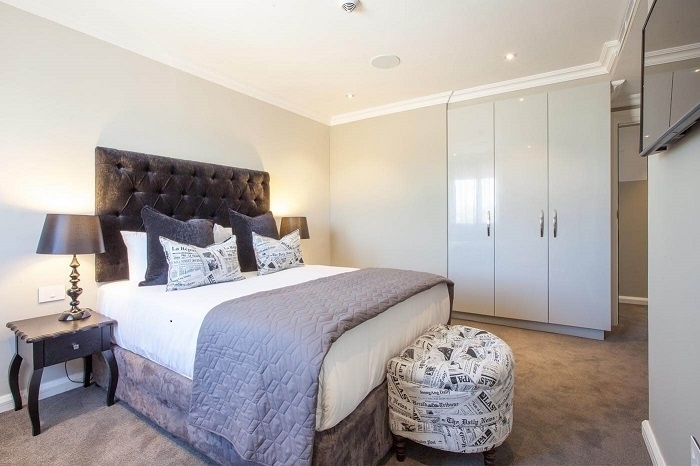 This handsome room boasts a monochromatic and art décor scheme with an en-suite bathroom, beautiful high level Victorian toilet and powerful shower. 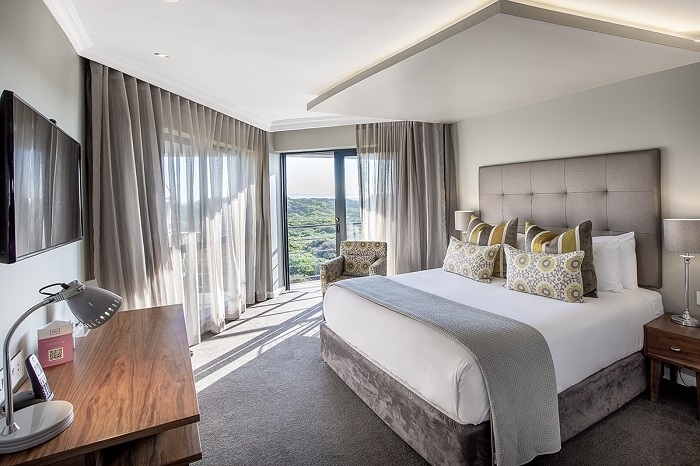 All our rooms have been designed to anticipate your every need with an array of luxuries and services including 100% block out curtains that allows you to decide when you are ready to meet the day. Relax in Victorian style or work in your room while you enjoy our delicious Room Service Menu. Don’t forget, your room card will allow you to exit the beachfront gate and gain access to your exclusive private beach. Book this room on its own or with room 203 as a two room Victorian paradise. Overlooking a green strip of natural fynbos, sneak peaks of the Atlantic ocean and Bloubergstrand, this view is magical. 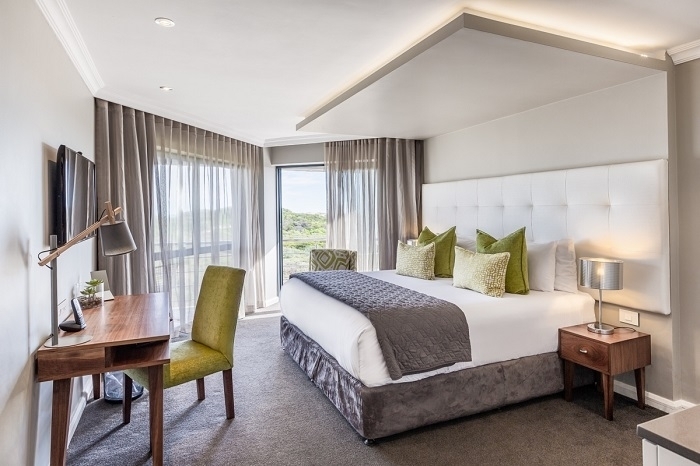 Walk downstairs to your own slice of heaven on our quiet beach, or sit back and relax in our stylish rooms with cozy ambience and calming mood lighting. Breakfast at Beach + Bites restaurant or in the privacy of your room, if the weather permits, enjoy it on your balcony or at the pool! Access to the pool, beach, bar and rooftop terrace where you can enjoy our breathtaking view. Modern bathroom with slipper bath and luxurious shower with a full set of Bliss toiletries. This plush Family Suite includes a generous lounge area with sleeper sofa in case you’re travelling with children and need an extra bed. 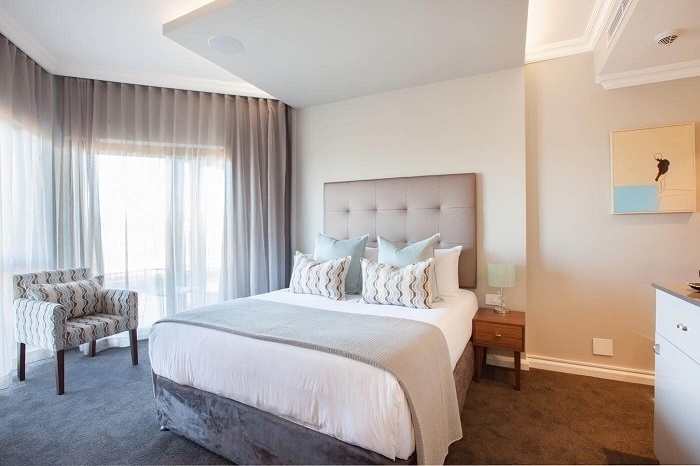 The gorgeous main bedroom has a King Size pillow top bed and is decorated in a modern contemporary scheme. If the mood strikes you, sit outside on the balcony where you can enjoy a morning cup of coffee or a glass of wine selected from our cellar. The large bathroom has a beautiful slipper bath and shower.